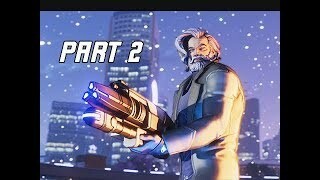 Agents of Mayhem Walkthrough! Walkthrough and Let’s Play Playthrough ofAgents of Mayhem Live Gameplay and Commentary in 1080p high definition at 60 fps. This Agents of Mayhem walkthrough will be completed showcasing every level, mission, boss, and story ending. Agents of Mayhem is a spin-off of the Saints Row series, taking place after the “recreate Earth” ending of the Saints Row IV expansion, Gat out of H***. The game’s plot revolves around an organization known as M.A.Y.H.E.M. (Multinational AgencY Hunting Evil Masterminds), founded by Persephone Brimstone (a character first seen in Gat out of H***) and funded by the Ultor Corporation (one of the main antagonists of Saints Row 2 and the Red Faction series, later merging with the Saints in Saints Row: The Third). Bearing the Saints’ purple fleur-de-lis logo, M.A.Y.H.E.M’s goal is to stop supervillain organization L.E.G.I.O.N. (the League of Evil Gentlemen Intent on Obliterating Nations) from destroying the world’s nations. The game is set in a near-future version of Seoul, South Korea.